Electronics Engineering Workshop provides a basic introduction of electronic hardware systems and provides hands-on training with familiarization, identification, testing, assembling, dismantling, fabrication and repairing such systems by making use of the various tools and instruments available in the Electronics Workshop. Experiments-for the Familiarization and testing of electronic components (Active, Passive, Electrical, Electronic, Electro-mechanical, Wires, Cables, Connectors, Fuses, Switches, Relays, etc. 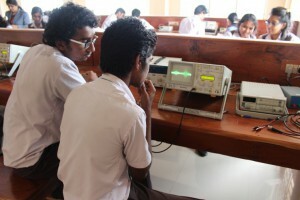 ), instruments (Multimeter, Function Generator, Power supply, CRO); Familiarization, design and fabrication of a single sided PCB; Inter-connection methods and soldering practice; Assembling of electronic circuit/system on general purpose PCB, test and show the functioning- are the experiments conducted in this lab. 1.Familiarization/identification of electronic components with specifications like connectors, fuses, switches, relays, displays etc. Familiarization of electronic systems like TV, DTH, CCTV, CRO, FG, CATV ETC. 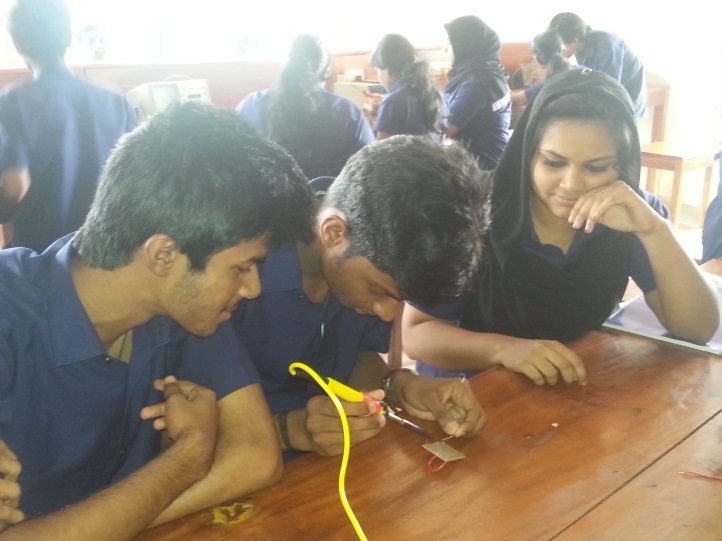 3.Testing of electronic components : resistor, capacitor, diode, transistors, UJT & JFET using multimeter. RC coupled amplifier with transistor BC 107. 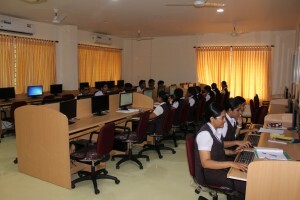 The Electronic Design and Automation Laboratory works under the Department of Electronics and Communication Engineering. 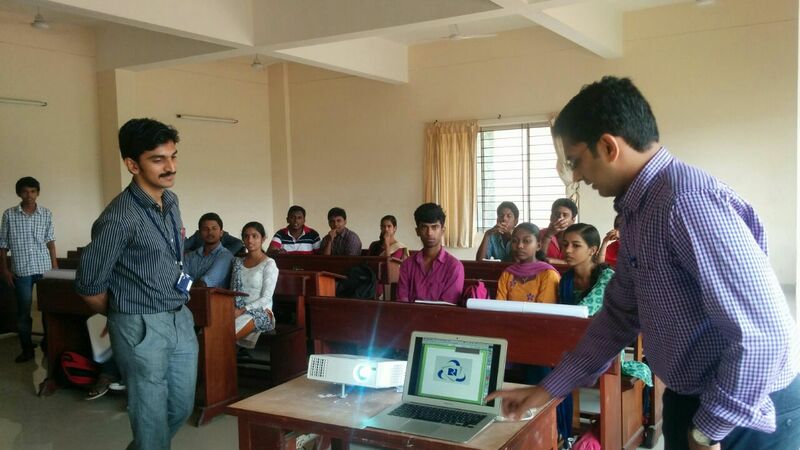 The Lab caters to the requirement of the students with respect to various lab sessions. Electronics lab is well equipped with the latest signal generators, oscilloscopes, measuring instruments etc. The lab has all the required equipment and consumables to carry out the experiments as per the syllabus as well as beyond the syllabus. 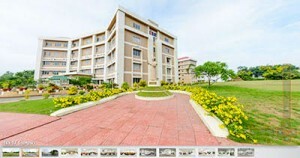 Guidance is provided to the students by a team of expert faculty and lab technicians. 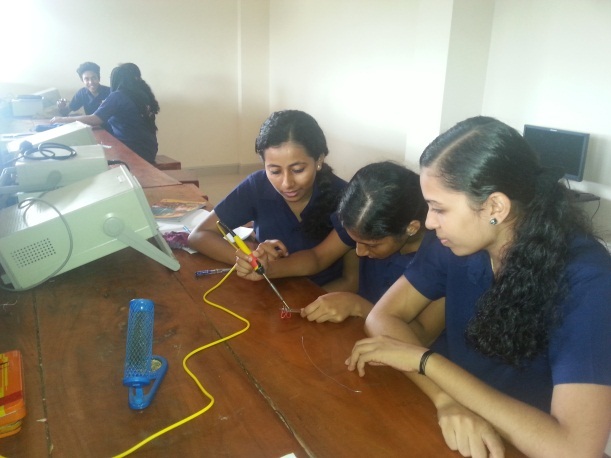 The objective of this lab is to perform various experiments to consolidate basic knowledge in digital electronics. Digital IC technology advances year by year at a rate which is unimaginable for other areas of technology. But the basic knowledge remains the same. Every digital system, no matter how complex it is, is built from logic gates and flip-flops. 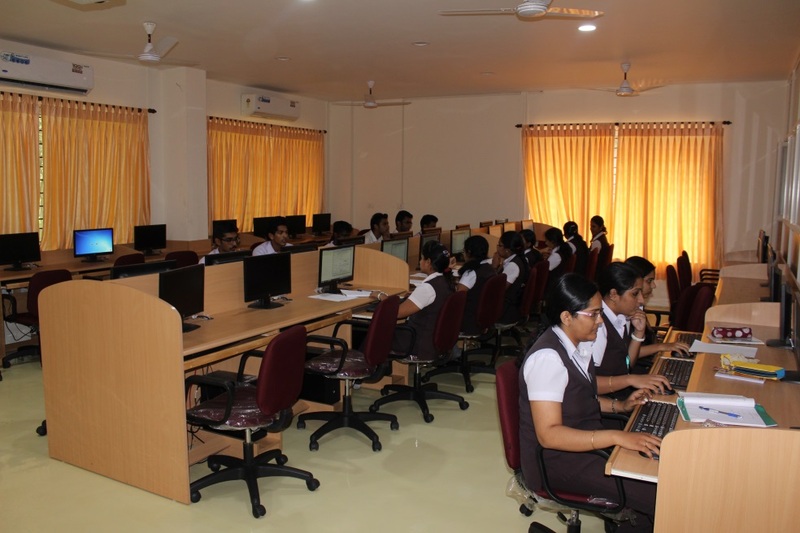 Digital Electronics Lab provides a platform for the students to have hands on experience with digital ICs. The students will be able to have a better understanding about the concepts learned and they will gain experience in designing, testing and realizing digital circuits. The lab is equipped with digital training kits which were developed in-house. Study of Logic Gates: Truth-table verification of OR, AND, NOT, XOR, NAND and NOR gates. Implementation of the given Boolean function using logic gates in both SOP and POS forms. Design and Realization of half, full adder or subtractor using basic gates and universal gates. Flip Flops: Truth-table verification of JK Master Slave FF, T and D FF. Asynchronous Counter: Realization of 4-bit up counter and Mod-N counters. Synchronous Counter: Realization of 4-bit up/down counter and Mod-N counter. Ring counter and Johnson Counter. Design examples using Multiplexer and De multiplexer. 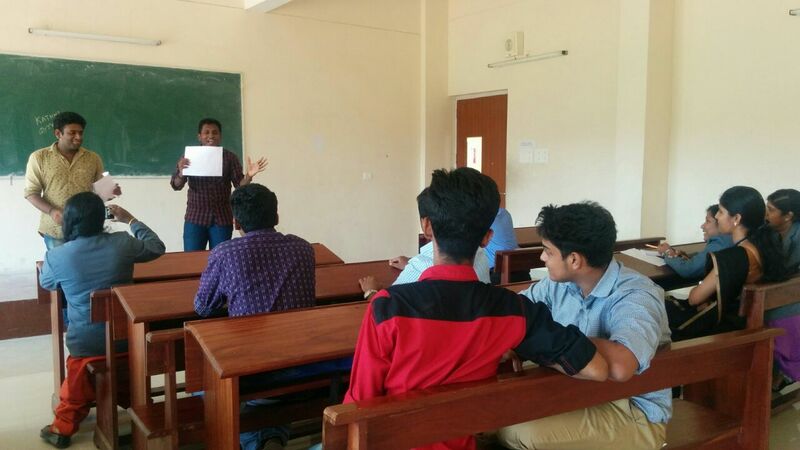 Focus on the fundamentals in the field of Communication Engineering is very important as it enables the students in coping up with the ever evolving technology. A Chinese proverb states that “I Hear and I Forget, I See and I Remember, I Do and I Understand”.The Communication Laboratory facilitates the students to understand the basic concepts by providing hands on exercises with Analog Communication circuits. The fundamental concepts such as amplitude and frequency modulation, pulse modulation techniques, filters, oscillators, super heterodyne receiver, time division multiplexing, phase locked loop, signalling techniques like ASK, FSK, PSK are implemented in the lab to reinforce the basic principles introduced during theory lessons.The Laboratory is equipped with Cathode Ray Oscilloscopes, Storage Oscilloscopes, Function Generators, Power Supplies and a demo kit to demonstrate Amplitude Modulation & Demodulation. It has a well stocked store of discrete components and Analog and Digital Integrated circuits to cater to the experiments executed in the lab. This lab provides experience on programming and testing of few electronic circuits using 8086 and 8051 simulator. Also there are some interface experiments between trainer kit and personal computers, which will makes the students to learn the basic interfacing concepts such as ADC/DAC interface, stepper motor interface, display interface, relay interface etc. Programming experiments using 8086 (MASM) like sum of N numbers, sorting, factorial of a number, concatenation of 2 strings, square, square root & Fibonacci series. Programming experiments using 8051 simulator (KEIL) such as addition & subtraction , multiplication & division, matrix addition, multiplication by shift and add method. Interface experiments using trainer kit/ direct down loading the programs from personal computer like ADC/DAC interface, stepper motor interface, frequency measurement, wave form generation, relay interface. Advanced Communication Lab provides support for training the students in the area of communication engineering. The circuits performing the analog and pulse modulation schemes are experimented on bread boards. Microwave test bench (Klystron tube) and the dipole antenna setup are the highlights of this lab. Modulation and demodulation in both analog and pulse domain, studying the characteristics of klystron tube and VSWR measurement, plotting the radiation pattern of dipole antenna are some of the important experiments conducted in this lab. Matlab experiments like MSE estimation of signals, Huffman coding & decoding, implementation of LMS algorithm. pursuing research. 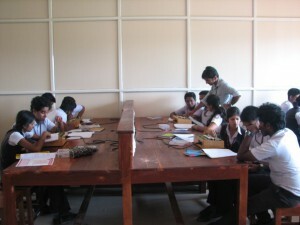 This lab is designed such that it can also function as a smart classroom and seminar room. 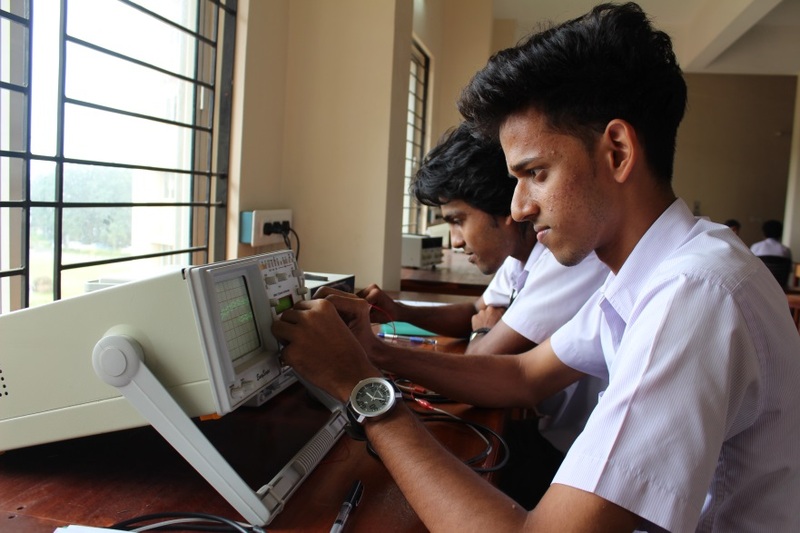 Every year, basic introductory classes on simulation tools for Electronics and telecommunications are conducted for students using the facilities provided in the lab. The objective of this lab is to perform different experiments to get a thorough knowledge of the various gates and circuits used in VLSI Design. They get to design the digital circuits in different modeling styles. To add on, they are also exposed to the embedded world using PIC where-in one can program PIC for several functions or can interface it with outside world. The students will be able to have a better understanding about the concepts learned and they will gain experience in designing, testing and implementing digital circuits. The lab is equipped with Simulation software’s like Xilinx ISE/Vivado and FPGA/PIC Boards. Prototype development lab is a unique laboratory that facilitates the research and development of electronic products. This lab helps the faculty and students to realize innovative concepts into working reality.The digital trainer kit that is used by the students in the Digital Electronics Lab to experiment on digital circuits was developed in the prototype development lab. 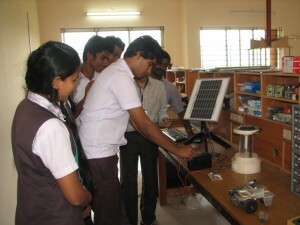 Additional products developed in the lab include among others FM transmitter for college radio, a quiz buzzer and sun tracking solar panel system.